Founded in 1997, the eLan Property Group is a Durban-based company with a regional wealth creation vision. Headed by CEO Mark Taylor, the Group has become a leader in turnkey real estate developments. With experience and expertise in identifying development opportunities, the Group has perfected a unique approach to conceptualising developments, bringing them to life and successfully executing the marketing and sales functions. The Group has facilitated developments in excess of R2 billion, including the fastest selling residential estate in the country, Simbithi Eco-Estate in Ballito. 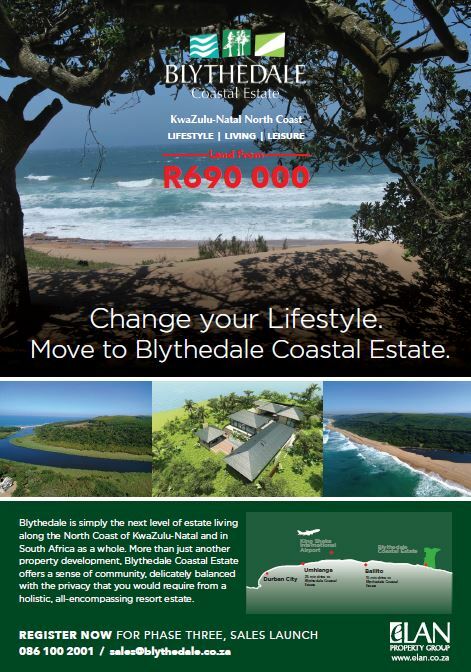 The Group's flagship development at Blythedale Coastal Estate on KwaZulu-Natal's North Coast incorporates 1,000 hectares of prime North Coast real estate. The multiphase development is an exciting combination of residential, commercial, and leisure facilities. The natural beauty of unspoilt golden beaches, indigenous coastal forest and pristine river frontage is attracting local and international buyers. Partnerships in Mauritius enable the group to offer turnkey investment solutions to South Africans wanting to invest in the island. The Group partners with those who share a passion for investing in the vast hospitality and real estate opportunities that the African continent and Indian Ocean Islands have to offer. Operating in the private sector, the Group uses the eLan Foundation as a vehicle to kick-start cooperation and public and private partnerships. As more companies are looking to the triple bottom line (profit, environmental responsibility and social awareness), business is now operating with a conscience. The eLan Foundation aims to boost the multiplier effect, minimising leakages and improve linkages for the region. To become Africa's leading developer of lifestyle and tourism investment opportunities. To deliver world-class property development and hospitality investment opportunities that offer their investors security, confidence and return on investment.